I took a little break for Christmas because my house was drowning in wrapping paper. Wasn’t yours? We started off with 5 gifts for each kid (because our families are so incredibly generous!) and with each Target trip or Amazon browse, it ended up 10 gifts for each kid. Oops. With all the busyness during the holidays, I wanted to make something super easy for my husband’s co-workers. 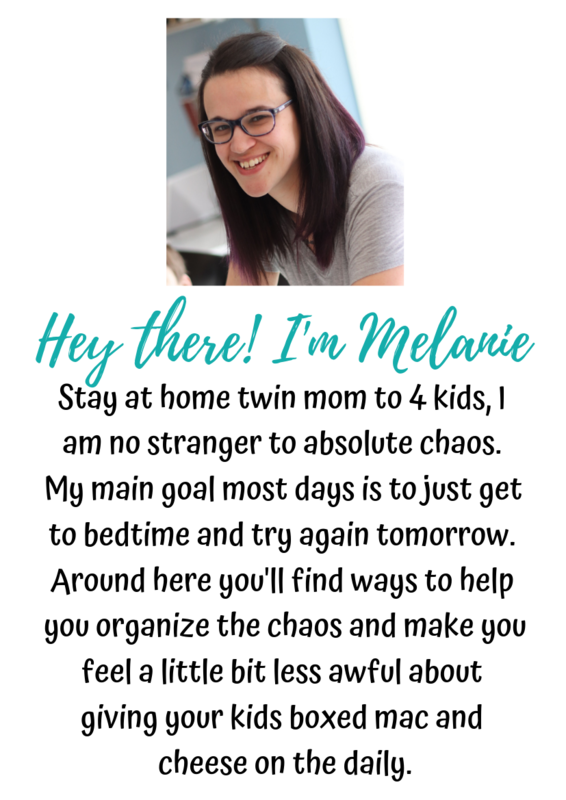 So (just like the start of almost every other blog post,) I took to Pinterest. One of the first things that came to mind was bark recipes. They seemed easy enough and I actually had all the ingredients. Now, guys…when I say easy, I mean easy. I mean “2-3 ingredient, only use your microwave and freezer” easy. I had all the ideas running through my head (not surprising) about what to use for a bark, so I decided to do 3 different kinds. The first one I did was a pretzel peanut butter chocolate bark. 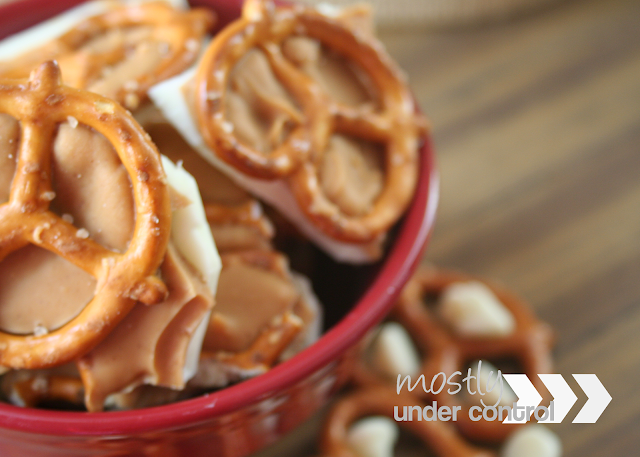 Because who doesn’t love pretzels? And peanut butter? And chocolate? 1. Line a jelly roll pan, baking sheet or 13×9 baking pan with wax paper. 2. Pour the chocolate chips into a microwave safe bowl. Microwave in 30 second intervals, making sure to stir in between intervals. 3. Once completely melted, pour the chocolate into the wax paper lined pan. 4. 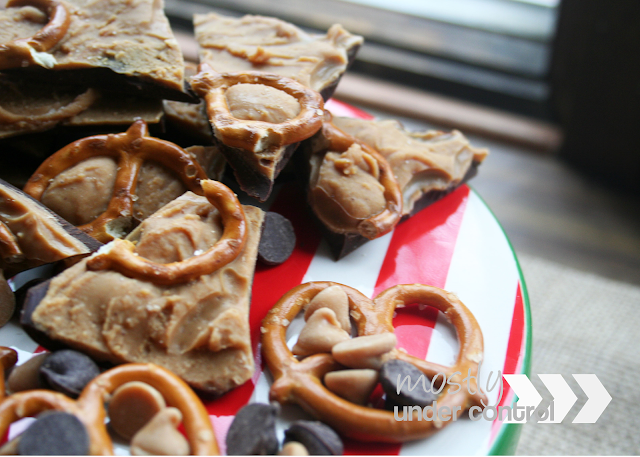 Spread the chocolate over the wax paper with a rubber spatula. 5. Place the pan into the freezer for 15 minutes. 6. 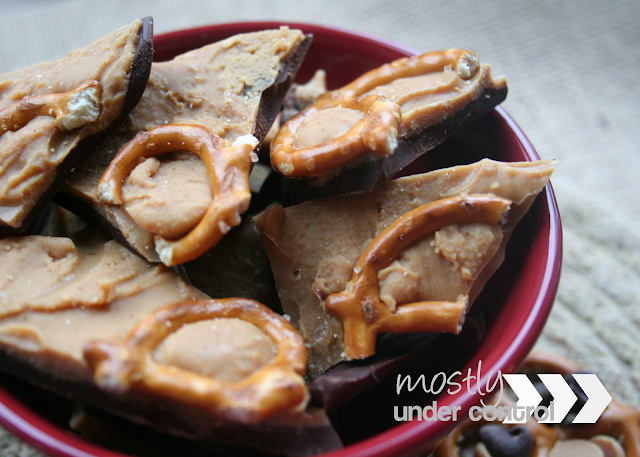 Right before you take the pan out of the freezer, melt the peanut butter chips in the microwave the same way as the chocolate. 7. Pour the melted peanut butter over the chocolate layer. 8. Working quickly, place the pretzels on the peanut butter and PRESS DOWN. If you don’t press them down, they will pop off when you break apart the bark. 9. Place back into freezer for at least 30 minutes. 10. Break apart and package up or just enjoy! My second one comes from the delicious combination of white chocolate and peanut butter. 2. Pour the white chocolate chips into a microwave safe bowl. Microwave in 30 second intervals, making sure to stir in between intervals. 3. Once completely melted, pour the white chocolate into the wax paper lined pan. 4. Spread the white chocolate over the wax paper with a rubber spatula. 6. Right before you take the pan out of the freezer, melt the peanut butter chips in the microwave the same way as the white chocolate. 7. 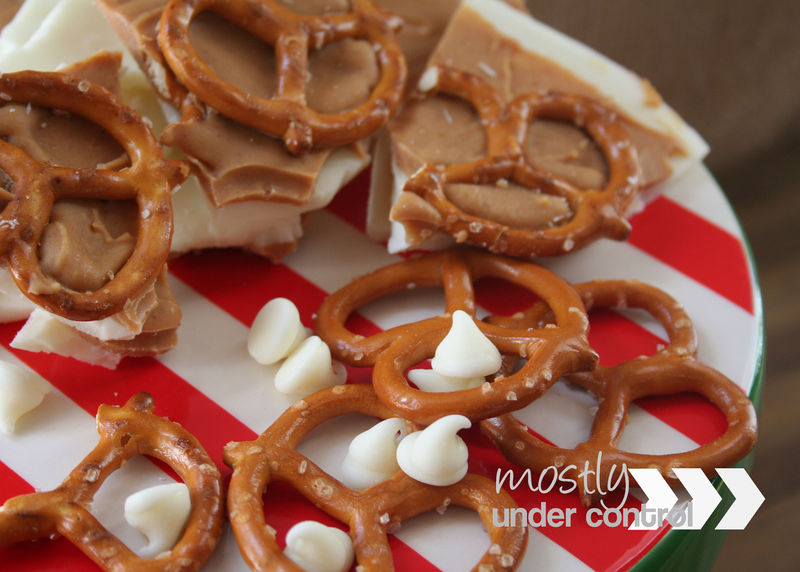 Pour the melted peanut butter over the white chocolate layer. 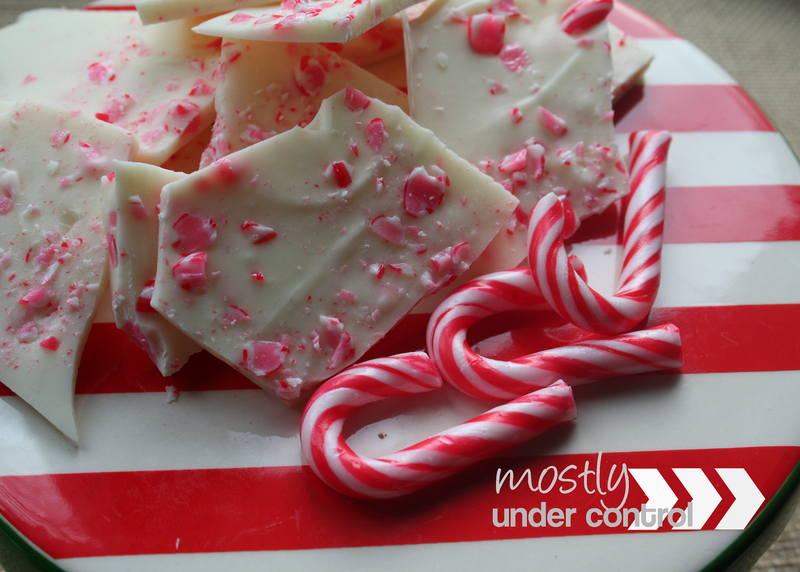 And for my third and final act, white chocolate peppermint. It’s even easier than the other 2! Because it’s one layer. 3. 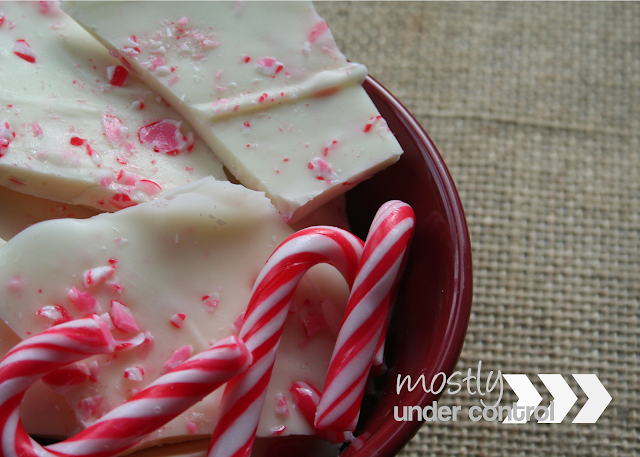 Once completely melted, add 5 crushed candy canes and stir to combine. Pour the white chocolate into the wax paper lined pan. 5.Top the melted chocolate with the remaining crushed candy canes. 6. Place back into freezer for at least 30 minutes. 7. Break apart and package up or just enjoy! I know that Christmas is over (WAAAH) but you can totally bring this to a New Year’s Eve party! They are all so super delicious. 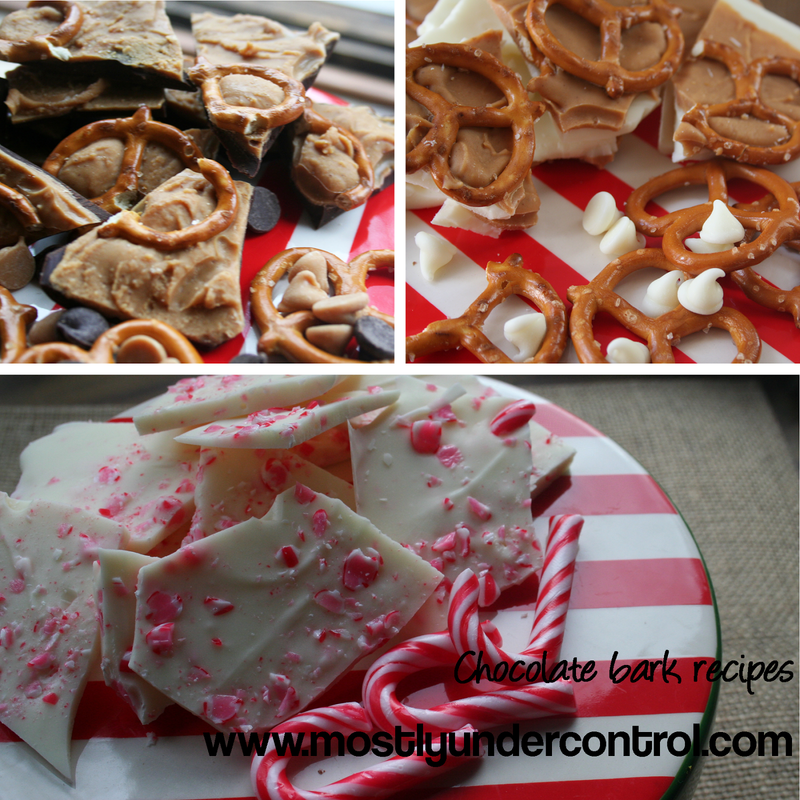 And maybe this will inspire you to try some new bark recipes!